Who Has The Best Decorated Home In McLendon-Chisholm? Entries submitted will be sent to the Council Members to review the entries in person between December 8-9, 2018 between 7pm and 8pm. On Tuesday, December 11, 2018 the City Council Members will Vote on the entries. Winner will be announced on Tuesday, December 11, 2018 at the City Council Meeting. 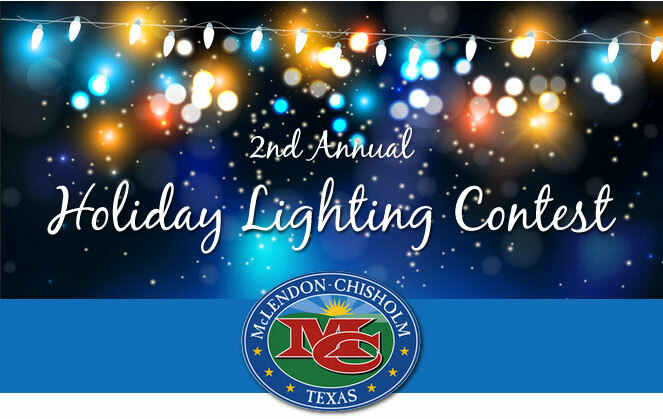 – The contest is only eligible to houses/addresses inside the City Limits of McLendon-Chisholm. – You must be 18-years-old or older to participate. – You must be nominated to have your house judged either. – You can nominate yourself, a friend, or a neighbor. – Email or call your nomination in to the City Secretary by midnight Friday, December 7, 2018. – Winners do not need to be present to win a prize. – Winner will receive recognition on McLendon-Chisholm.com and City of McLendon-Chisholm Facebook Fanpage. – Prizes will be listed below for 1st, 2nd and 3rd soon. – We are looking for businesses that would like to donate a prize for the 1st place, 2nd and/or 3rd place winner. Please contact Lisa by phone or email.